Easter is almost a full month later than it was last year, this means that the weather will be a lot nicer! It also means that we all won’t freeze when we’re out and about this coming Easter Sunday. I have a lot of fond memories of celebrating Easter with my family. The earliest Easter memory that I have is from when I was around 5-6 years old. I remember looking out the window Easter morning and seeing my dad outside in the backyard with a bunch of plastic eggs. I got so mad because I thought he was stealing the eggs that the Easter bunny had left for my brother and I! It’s a funny story that I like to tell every year. Twenty-something years later I no longer participate in Easter egg hunts but I do still take part in some activities. I love decorating my house with bunnies and baskets, I bake a lot of goodies, and I buy fresh flowers to put around the house. My family also does a brunch every year at a local restaurant and I ALWAYS order chocolate chip pancakes! Then we go back to my parent’s house and eat more sweets! What are your families Easter traditions? 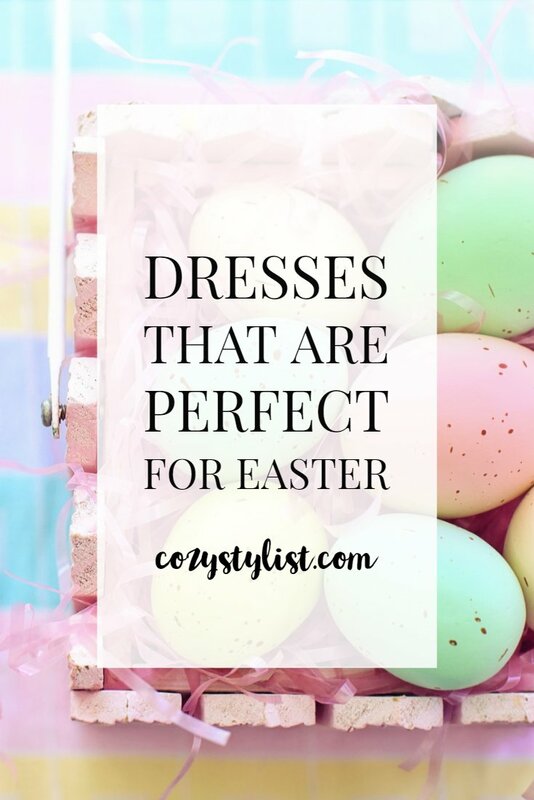 This time a year stores have a lot of cute spring dresses in stock so it’s the perfect time to find a cute Easter dress. I am not a huge fan of big floral prints or bright pastel colors so Easter dresses are always a challenge for me. The one in the picture above, however, caught my eye last week in Nordstrom Rack. I thought it was adorable and would great with a jean jacket over top of it. You can shop the items I am wearing below. I paired the dress with Franco Sarto Espadrilles that I got on sale last summer. Have a great week everyone and Happy Easter! These are such cute dresses!